While it is said we read to know we are not alone, it is also true that libraries and bookstores are communal places, providing a safe environment for all and filling vital, societal roles. Having worked in both for more than 40 years, I can attest to these dual notions. Of all my interactions over the years with readers, customers and library patrons, two instances remain strong in my memory. The first was some years ago when a woman in her 60s was hesitant to come into my bookstore. It transpired that she had never been in a bookstore, did not read, and only came in on this particular day as she wanted to buy a book for the person who had been taking care of her during illness. This one visit turned into regular appearances and many pleasant chats about books. One Christmas she greeted me and thanked me, telling me that she had lived all her life in a housing commission flat in Kensington, Melbourne, but now, through reading, she 'lived in the world'. The other interaction occurred only recently. A group of five teenage girls of Maori descent came into the library and sat in a group under one of many large black and white photographs of people from the local area. In both instances, I was proud to be providing a safe and welcoming place for people who may not always be made to feel at home; and I was buoyed by the idea that those young girls would hold lovely memories of their aunty in the context of the local library. Libraries have never been needed more than in these times. They are, at turns, safe havens, information bureaus, meeting places, and study locations. They are open to all and do not pose any financial barrier in that their services and activities are free. This is vital in societies where the disparity between rich and poor is growing and where people from all backgrounds are finding their way in their new homeland. "In the last few weeks, I have helped a woman recently arrived from Ethiopia to navigate online job searching; chatted with an elderly Italian gentleman who has suffered a bereavement; and offered a membership to a woman for her adult son, who had a mental disability." As well, libraries offer a connection for people who may not see or speak with another person over a day; they are a point of contact for the marginalised and those living on their own. There is no discrimination in a library and there is no impediment to anyone accessing the services. This is increasingly important as our government demands online interaction only and many in the community either do not have computer access or are not sufficiently proficient to use their computer without guidance. In the last few weeks, I have helped a woman recently arrived from Ethiopia to navigate online job searching; chatted with an elderly Italian gentleman who has suffered a bereavement; and offered a membership to a woman for her adult son, and offered a membership to a woman for her adult son, who had a mental disability. The mother was grateful for the welcome and willingness to give her son access to the collection. Over my long career in bookselling, I was sometimes told 'for bookshops, it's all about the money. Nothing could have been further from the truth. I believe bookstores are vital to a community and are a sign of a healthy society; one that is inquisitive, open to ideas, and wanting to engage with others. This is why we instigated and ran the Crime & Justice festival for ten years — as a sign that our store was a conduit for discussion about the world around us. And, it's why I continue to plan literary events. We are fortunate to have libraries and bookstores, and both are worthy of our support and protection. Across the United Kingdom, libraries are under threat from budget restraints, with more than 400 libraries closed in the last seven years. This is also happening in Canada, where a mix of closure and underfunding has seen their library services diminished. When the local library and its array of services is the 'heartbeat' of the community, it is important to recognise its role and ensure its protection from government and council budgeting expediency. Jerry Seinfeld (not necessarily the first person one would think of to quote!) has said: 'A bookstore is one of the pieces of evidence we have that people are still thinking'. Let us celebrate our libraries and bookstores and let us protect and nurture them for the health of our society. Recent articles by Mary Dalmau. 'More than 400 libraries closed in the last seven years. So what? The number of libraries per se is not a measure of the level or accessibility of library services any more than the number of corner shops or service stations. Free, facilitated, uncensored access to information, opinion, and literature is essential for the health and welfare of individuals and society even more, perhaps, than in the past, and small library branches and bookmobiles may still have some role to play in service delivery in some places, but other platforms and formats are also needed to do justice to the demands on a full modern library service. Nostalgia ain't what it used to be, nor is the best way of delivering library services in the first quarter of the 21st century what it might have been in the 1950s. Vital reminiscences. What better argument for restoring weekend and public holiday opening of public libraries. Marjorie, retired librarian in public and university libraries. Thanks for this uplifting article on the value of libraries and bookstores. In answer to Ginger's mentioning of delivery of library services in the first quarter of the 21st century I would say: books have weathered the challenge from the internet and from smartphones. 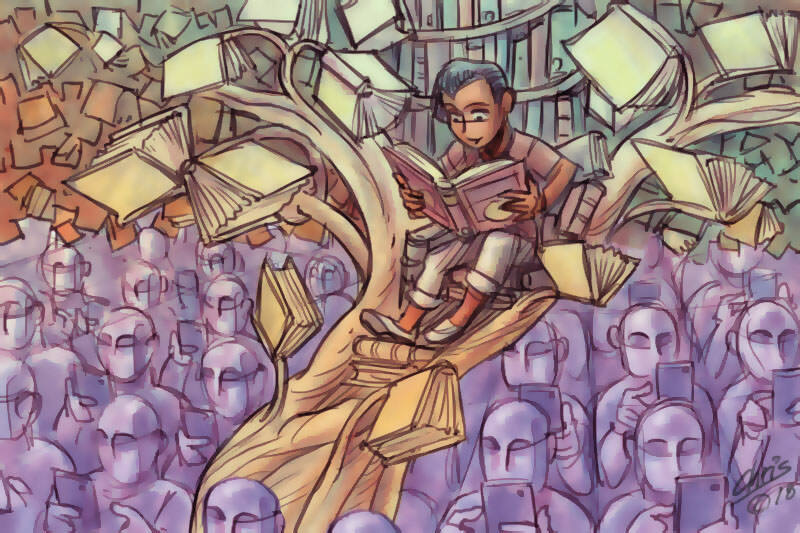 Technology is essential to the modern library but just as essential, and more important in a relational sense, is the community feel, the human interaction and the very great pleasure of holding a book in one's hand. I've had many interesting conversations in our local library, have felt valued (despite mistakes) and would be prepared to blockade the highway that cuts through our town to stop anyone from closing our little library. My wife co-ordinates a knitting group at Bankstown Library and Knowledge Centre each Friday. The group of women who come along are from a diverse range of backgrounds some with very limited English. They chat as they knit learning a hobby skill but also increase their English. They have also commenced using the library's facilities and borrowing books. Libraries are a major community facility. I agree totally that libraries are the heartbeat of our communities and, along with the groups Mary has mentioned, provide a life line for parents with their reading and engagement sessions for young children. Libraries give the gift of the wondrous and inspiring worlds of books to our future generations whilst modelling for parents. Invaluable for our society! "So what"? That closure means local and national governments have decided that 400 UK communities can be denied free, facilitated, uncensored access. I am quite dismayed by a development since my student days in our university libraries, where books are now secured from any browsing eyes, and are only accessed if one asks for a very specific title. Gone are the days when we could simply wander the shelves finding insights and inspiration in chance discoveries. Public libraries still provide this opportunity for cross-fertilisation of ideas (once valued by our tertiary institutions), but unless we act, for how much longer? When I was 15, I nearly failed the State English exam at the intermediate level at school. I was so appallingly bad at writing essays etc that I decided to join the public library for the princely sum of 25 shillings. To my dismay I discovered that I had purchased the world and became addicted to the thrill of this Eureka. Two years later, clearly through some State administrative error, they reckoned I topped the State in the School Leaving exams in English. I always knew, as is widely proclaimed by the pundits these days, that the State School leaving exams meant nothing!! Books and other library resources, including online access to a range of materials, are a comfort, a solace, a source of inspiration and information, great company, a safety net, a source of spiritual sustenance, food for thought and a gift to the imagination. I can't imagine life without them, even if there are those who have found their own substitutes for these sources of practical and social and cultural well-being. In an administrative system that increasingly wants to put a price-tag and a cost factor on everything, let us give thanks for our libraries and librarians, and our bookshops and booksellers too. We are so fortunate to have them, and our libraries are an invaluable resource on many levels. Shutting them down would be an incalculable loss. Kevin, my limited experience of small UK libraries is they don’t hold a candle to our larger municipal libraries in Victoria in terms of either book stock, hours of opening, or level of service. I share your discontent with books being stored off site and accessible only on request. The State Library of Victoria used to be like that but more and more books are now being made easily accessible in digital form not only from within the library itself but also remotely from home. Ginger Meggs: “Nostalgia ain't what it used to be, nor is the best way of delivering library services in the first quarter of the 21st century what it might have been in the 1950s.” It’s likely that in the last quarter of the 21st century, you, in your splendid isolation at home, will, through your modem, be able, quite cheaply, to enter a virtual library in which everything you would find in a physical library, including the librarians, will have been digitised. If you find it more enjoyable to browse through the virtual aisles of an online library than to perambulate through the actual aisles of a physical one, good for you, but will people then still assemble in malls when every chain store or franchise they would find in a mall would have a webpage from which they can place orders to be expedited to their porches by drones? If the human DNA includes a preference to browse by touch, nostalgia might remain what it always used to be. I’ve no idea Roy part nature rather than nurture plays in the sense of touch. I know that touch (and smell, and taste, and temperature, and sight,and sound are important senses and I know the joy of handling a familiar and much loved book. But I also know that if we are to open up the world of learning and the joy of reading to as many people as possible we must utilise a whole raft of technologies and not rely simply on hard copy books. Just as stone tablets, papyrus, and medieval scrolls have gone the way of all obsolete formats. Yes, digitalisation has made many works accessible and I also have benefited in finding rare books this way, but online browsing is not truly browsing: Either you make a specific search, or an algorithm feeds you items which the system has already decided you are interested in. No joy of a chance discovery and the broader insights it gives. Just the other day I visited my local bookshop to buy a very particular artist's biography for my sister's birthday. While browsing I happened to discover a book on Joan Lindsay. I now look forward to reading this, but I had no knowledge the book existed before then, nor would I have bothered to search online for one. Your online searching or browsing is too constrained, Kevin! Open up your search terms, follow up the result on the fifth and sixth pages. Use the same approach that you would in a bricks 'n mortar site. Can you imagine browsing a library of stone tablets? The value that librarians and book sellers add is the order, presentation, and accessibility, not the format. Accessibility is the point Ginger. There is chance discovery while seeking something else. I did also obtain the book I sought for my sister at that same bookshop. By the way, I have browsed libraries of stone and clay tablets: Much cuneiform can only be studied in 3D, and our universities once provided access to those too, even for the general public. I worked for 20 years at Vision Australia Library and have seen how books are enjoyed by all. I encourage my great nieces and nephews to read by giving them books at Christmas. Reading all kinds of books can give lonely people company and solace. We can also learn great things from books and while away many hours of leisure.